Just about seven years ago to the day, we exclusively posted the very first video of the fretless fader from John Beez. He came, he saw, he dropped another video (love that Thes One beat), and then disappeared into the shadows, leaving an entire turntablist scene pining for a version that they could actually own and not just watch. The scene waited… and waited… but John Beez had retreated back to his lab. In the meantime, many had picked up the gauntlet and brought forth their own variations on the original theme. But now John Beez is back with a reworked fretless fader that doesn’t require Vestax 06 dissection, and appears to work on any mixer with enough faceplate real estate, and probable minimal modding. The Facebook page that popped up yesterday hosts just one video and no information. We’ve reached out to John Beez to get more information, but in the meantime, let’s see of we can work out what’s happening here. The first very obvious thing — the Z2 mixer hasn’t been butchered, but instead the fretless fader and slider sit on top. We can see that a ribbon cable runs from the fretless fader to the inside of the mixer, but outside of that we’re guessing. So let’s do just that. Because the Z2 has retained its innards, my guess is that the box with the screen at the top is the brains of this outfit. I reckon that a cable runs inside the Z2 from the slider to the custom box. This box directly controls the pitch of the Controller One, and has selectable scales — indeed when John turns the knob, the display changes from minor to minor pentatonic to blues, and the Controller One static pitch changes to reflect this. So my guess is that this new fretless fader kit consists of a fader (probably Mini Innofader judging by the red line on the cap), a slider rig, and an external brain that talks to the turntable. 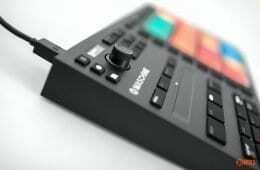 It’s very clever because it probably eliminates the need for heavy modding and thus wrecking the mixer, and means that you can move the fretless fader around mixers without doing much more than plugging in the crossfader ribbon cable. It’s a very smart solution, that remains elegant and practical because of the Mini Innofader’s low profile. 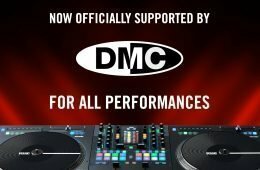 While we all might get giddy about the fretless fader and its possibilities, it’s vital that you remember one vital caveat with this and others like it — this depends on MIDI control over the turntable’s pitch, so it’s only going to work with Vestax PDX-3000 and above models, and the Vestax Controller One. There is a mod for PDX-2000s that was a kit but is now just instructions only, but I’m not aware of any such mods for other turntables. As a guide, I couldn’t find a single Vestax PDX-3000 on eBay UK. And good luck ever getting a Controller One for less than both kidneys. I guess that this is me sending a message to Hanpin via whichever manufacturer reads this — please work on a MIDI mod for your motors. I’m not saying add it as standard, but if it’s easy enough to do, it’s a USP that no other current turntable has. You’ll definitely win friends in the scratch scene. And DJ Tech — this is right up your street to add into the LF12, should it ever reach the market. I did fear that he’d gone forever. But if ever there was a way to come back, this is it. Because of the limited market, I’m not expecting the kit to be cheap, but at least it does appear to be something that even the most feint-hearted of technophobes can buy and use. We’ll have more news on this new version of the original fretless fader in due course.